Would love to be at the London discussion, but living in Kaikoura NZ I am almost exactly on the other side of the planet – so wont be (unless someone else comes up with the cash for the flights and accommodation). I have given the topic a lot of thought over the last 40 years. There is no doubt in my mind that the problem can be solved. What do those choices look like? What mix of technology, politics, psychology, and economics might be required? That is a very interesting question indeed. It seems that the technology part is relatively easy, the psychology not too difficult, politics is irrelevant in a sense (in that it responds for the most part to other drivers), and economics seems to be the key issue. Let me start with the last bit first. Money, or more accurately, our use of markets as a valuation tool, seems to be the greatest stumbling block. All people tend to look after our own self interests (as we see them), we respond to the incentive sets in place. Coming back to markets. Markets are great tools for distributing scarce resources. The more scarce something is, the more value it has in a market. This is so common sense that very few think past it. Yet it hides what seems to me the greatest existential risk to humanity that we currently face. Markets value scarcity, which logically implies that they devalue abundance. Real abundance (like oxygen in the air) has zero market value. That means that there is zero market incentive to ever deliver real abundance of anything. Solar energy is abundant and distributed; it cannot easily be controlled. Oil is hard to get at, and easy to make vast profits from. The cost of delivering a barrel of Saudi oil to port varies between 40c and $2.00, yet it sells for $100 – who is going to give up that sort of profit, and the political power it buys in today’s world? If we are going to solve this global warming problem, then we need to get people viewing their self interest in terms other than dollars determined in markets. That is going to take some work. Why aren’t clean energy sources slowing the rate of fossil fuel extraction? Quite simply, the rate of increase in demand still exceeds the rate of energy delivery from non-fossil sources. And non-fossil sources of energy are increasing exponentially, and based on current exponential trends will overtake fossil fuels by 2030 – according to the figures delivered by Ray Kurzweil in his November 15 2011 presentation (slides 61-63). Are the energy companies massively overvalued, and how will carbon-cuts affect the global economy? Carbon cuts will happen when other energy sources are available. Attempting to do so before then will destroy the “economy” and threaten us all. People need a vision of security and abundance, even if that is not their current reality. Will we wake up to the threat in time? Far fewer have woken up to the threat posed by markets, and the restrictions that markets impose on the delivery of new technologies (capital must make its profit from investments in past technologies before allowing new ones to take market share). And who can do what to make it all happen? We can start asking the really hard questions. We can start asking the unasked questions. We can start questioning the unquestioned assumptions. Psychologically the vast majority of human beings are primed for social cooperation. We have an inbuilt sense of justice, and injustice. Lies and half truths can work only so often, eventually people start to sense something is wrong, and then to see what is happening. We have an option to be leaders. We can lead humanity to a future of peace and security, a world beyond markets. It seems clear to me that we really have little other choice. 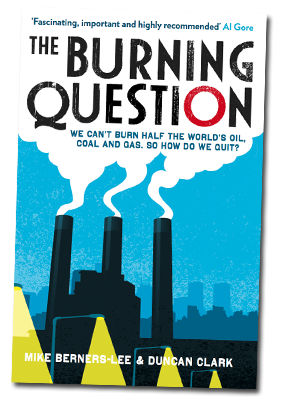 >>Why aren’t clean energy sources slowing the rate of fossil fuel extraction? >Quite simply, the rate of increase in demand still exceeds the rate of energy delivery from non-fossil sources. The chart labelled “Total human energy consumption since 1850” in the book, which you can see here, shows what we’re up against. See also this one, “Net additions to the world’s energy systems in the period 2001-2011”. This should change when solar power (and/or other renewable energy sources) becomes even more efficient, but I’m skeptical about simply extrapolating existing exponential improvement curves. >We are rapidly approaching the technical capacity to deliver real abundance of all of the necessities of human life; yet not only is there no economic incentive to do so, there is massive economic incentive to prevent it happening. 2.) Place a fairer monetary price on the use of carbon-rich fuel – a price that takes into account the negative externalities of the impact on the climate. – which I am not sure I agree with. It is true that politicians will respond to large-scale groundswells of opinion. And that is something that the discussion on “The Burning Question” can impact. I agree with you in a sense. For so long as most people experience real scarcity in their lives, then it will be difficult to move away from the values of financial capital. Markets make good sense when scarcity is real. If we once create a set of machines that can use sunlight and local rock to replicate themselves, and can produce a basic range of goods and services required to support humanity, then that is a game changer. If those machines have a two week doubling time, then in less than 2 years from making the first one, we can supply one to every person on the planet. When that happens, then people will not be experiencing real scarcity in their lives, and it will be possible to move away from the values of financial capital. There is no such thing as a fair monetary price on carbon. Trying such a thing guarantees that all the carbon will be extracted, and bets on creating sink technology in time. That is also a mechanism that creates yet another set of vested interests in maintaining a carbon based energy system (the carbon sinkers). Far better to invest in creating a complete replacement, using widely distributed solar. But, and its a big but, doing so makes little or no sense to the current holders of capital unless we give them a reason to change their valuation time-frames. This is where the prospect of indefinite life extension is an essential element in bringing stability to the set of systems. Once there is a realistic prospect of ending bodily aging, and maintaining our 20 year old bodies indefinitely, then it is very much in the interests of anyone who wants to live a long time to have security for everyone, and to encourage tolerance and.diversity. And I get there are a lot of interlinked concepts in this mix. >This is where the prospect of indefinite life extension is an essential element in bringing stability to the set of systems. Yes, that will be a game-changer, but I believe we need to take action sooner that than. When people come to believe that it’s likely that, later in their lifetimes, rejuvenation technology will become widely available, they may equally think that, later in their lifetimes, the technology of material abundance and abundant clean energy will become widely available. *) On the lifespan level, we need to maintain our personal fitness and good health in the meantime – avoiding actions that could lead to a downward spiral of our vital systems. *) On the planetary level, we need to avoid actions that could trigger a climate spiral tipping point (increased seepage of long buried methane from frozen tundra, etc) in the meantime. >There is no such thing as a fair monetary price on carbon. Trying such a thing guarantees that all the carbon will be extracted, and bets on creating sink technology in time. But if fossil fuel extraction were more severely taxed, it would increase the price to consumers, and encourage consumers to switch to lower-priced (greener) energy sources. It would also encourage the oil companies to invest more vigorously in becoming experts in other forms of energy, e.g. solar. One interesting variant of this idea, discussed in the book, is the “SAFE Carbon” initiative. SAFE = “Sequestered Adequate Fraction of Extracted”. See this note by Dr Myles Allen of Oxford University. This deserves wider attention. It seems clear to me that the most powerful action we can take is around reducing the existential fears that most people have, and creating a sense of security that promotes people recognising the global commonality of humanity (whatever their current cultural context). Introducing a carbon tax, or even a SAFE system, doesn’t really assist with that. Any increase in energy costs simply makes it harder for those at the bottom of the heap to survive. We don’t have a lot of money, and we do give $10 per day to the UN, to help in feeding those in need of food. It is a small thing, and it is something we have kept up even through our toughest financial times when I was diagnosed terminal cancer and told I might die within 6 weeks (I seem to have beaten). The increase in fuel costs doubled the cost of food and halved the contribution we were making thereby. Unforeseen and unwanted consequences! At another level, the idea that the earth has some sort of grand stability to it is utter myth. The earth is a very dangerous place. It suffers from periodic comet and meteor strike, large scale volcanism, ice ages, and all sorts of things that could be terminal to our civilisation. To mitigate those risks we have got to establish large scale engineering off planet. Once we build a self replicating machine, and launch it to the moon, then within a couple of years we will have all the engineering capacity we need to mitigate any global warming effects. Global warming is real in a scientific sense, and it is irrelevant in the greater scheme of humanity as an evolving technological civilisation. We need to push to break through the technological barriers that separate us from an age of abundance. Once we achieve that abundance, we can do whatever is technically required to manage earth’s climatic systems to provide optimal climate for humanity and a range of other ecosystems. I like nature. I am a conservationist. I enjoy the time I spend in the wild. And I have no illusions about any sort of grand balance in anything. Nature is a constant struggle for existence against competing forces. We have the ability to create something different, but not by imagining that something already exists that doesn’t. So I am a yes to thinking about mitigating strategies for all threats to humanity and to the ecosystems that support us. We also need to prevent global cooling (a much more dangerous scenario). We need to have a few trillion mirrors in space that allow us to manage how much sunlight falls where, so that we don’t get large dangerous tropical cyclones. We need a few million automated telescopes in far flung orbits, scanning for anything that might impact this planet. We need space stations capable of supporting all of humanity should some mega-volcanic complex (like the Yellowstone complex) decide to erupt. We need a lot of things, to provide security. We need to start valuing every living human being, and creating systems that ensure that everyone has all the essential of survival, and the freedom to responsibly choose whatever they want (without seriously impacting of the lives or freedoms of anyone else). Managing from where we are now, to a set of technologies that can provide us with that abundance, is our greatest and most urgent need. Climate change is real, and it is a side issue. Once we have self replicating robotics we can reverse or mitigate any unwanted effects of climate change. We could have self replicating robotics in a decade if we put half the funding into that that we currently put into the military.